Compass (navigation tool) A compass is a navigational instrument for determining direction relative to the earth's magnetic poles. 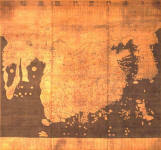 The compass was invented in ancient China around 247 BCE, and was used for navigation by the 11th century. 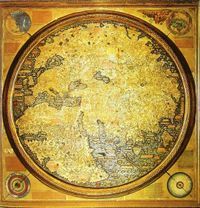 In addition to compasses and maps, medieval navigation tools included the astrolabe, quadrant, cross-staff, and sextant (items used to determine the altitude of the sun or other celestial bodies). It was not until the early 17th century that the telescope was first used for astronomical purposes. Historians have noted that Christopher Columbus was so inspired by the journeys of the Venetian traveler Marco Polo's description of the Far East, that he desired to visit those lands for himself. 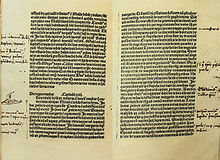 It can be said that the Silk Road indirectly inspired Columbus's voyages to the "New World," as there is evidence Columbus made handwritten annotations on a Latin edition of Marco Polo's book. 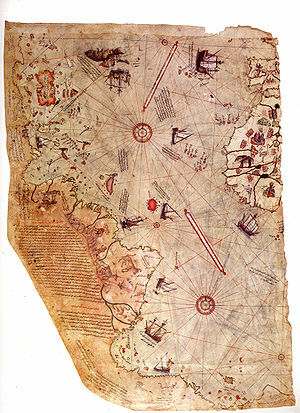 Left fragment of the Piri Reis map showing Central and South America shores. 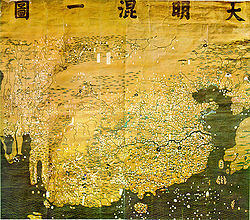 In his notes appended to it is written "the map of the western lands drawn by Columbus."